In that spirit, we asked Roger's beloved Far-Flung Correspondents and Demanders to contribute their own single-paragraph "minireviews" (as he usually referred to them) about the man himself. The challenge: To write "a 'capsule' about Roger — or, perhaps, TO Roger — capturing the essence of what his writing, and his presence in your life, meant to you." Sure, some of us went slightly over, but so did Roger sometimes. To him, no rule was inflexible. The important thing was to communicate -- in your own voice. 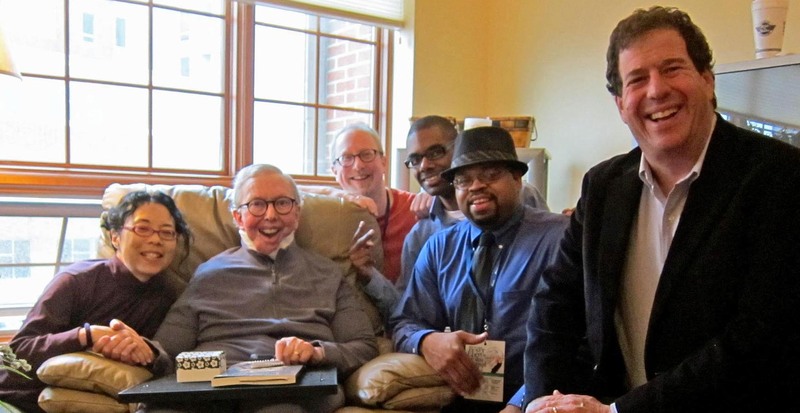 L to R: Jana Monji, Roger Ebert, Jim Emerson, Steven Boone, Odie Henderson, Donald Liebenson. I grew up watching Roger Ebert and Gene Siskel's show, which gave a movie-crazed Dallas kid a sense that there was a world of cinema far beyond the boundaries of my city, my country, my continent. It was only later, in college, that I discovered Roger's writing via anthologies sold in the campus bookstore. I didn't think of him as my teacher, but that's what he was. I was awed by his ability to discuss a film's values and emotions in terms that everyone could understand and relate to. That last skill was what made him not just respected, but popular, even beloved. Even critics who understand the value of connecting emotionally with readers don't have Roger's ability to do so. He was a humanist. Empathy flowed from his words. L to R: Olivia Collette, Odie Henderson, Omer Mozaffar, Pablo Villaça, Jana Monji, Michał Oleszczyk.